FINALLY managed to fix the %!§$*! language selector. I have no idea how it got messed up again, I do remember distinctly it was working some time ago. I’ve tested it in Firefox and Internet Explorer, if there are any problems remaining, let me know. Thanks at any rate for Gabriel C. at Bitrepository who’s article helped me fixing my website. We’ve just updated the Links with some information about whereabouts of the Nafziger collection. The first half of October 1915 passed in France, Belgium, Germany, Austria-Hungary, and Italy with half-expected clear weather, a variety of rare events, and violence borne of hapless confusion. Surely the most interesting aspect of early October was naval as the Entente fleets attempted to use their weight on and near the battlefront more directly than in the past. The bulk of Entente naval transports and landing craft, carrying two unsupported British rifle divisions and their separate divisional artillery, washed up in the Adriatic Sea blockade box, essentially dropping anchor in Brindisi, Italy to wait a favorable opportunity that might develop somewhere nearby. The vast bulk of the French combat fleet, together with most British armored cruisers and some pre-dreadnaughts and destroyers, and some Italian cruisers and destroyers, put to sea from their putrid Venetian anchorage, avoided Austrian light forces repeatedly, laid a minefield near the mouth of the Isonzo River, silenced coastal batteries near the front, and began to pound the Austro-Hungarian Army with heavy guns. The Italian air arm naturally failed to coordinate adequately with French and British admirals too angry about their duty to employ translators (two failed reconnaissance rolls) and the bombardment failed to inspire Italian infantrymen to leave their rifle pits. In practice, after entrenchments modified the rolls and aerial spies failed the same, Entente accuracy displayed itself as usual in bombardments, with only four hits scored on 134 points of gunfire. The Italian ground assault would have been suicide and did not follow. Elsewhere on the Italian Front, Italian forces continued to thin their lines around Trient in favor of massing toward the Isonzo. Entente leaders hope that the Italians can at least hold that one relatively inactive and forbidding sector of the Western Front, despite their reduced army, criminal equipment, and inept tactics. The British Army in Italy continued to hold the east side of the Trient salient, sixty-five miles of mountain passes extending into the impassable central Alps. A couple of British cavalry divisions continued to assist a crust of Italians to hold the sector between Switzerland and Trient. A few French units wandered toward Lake Garda apparently intent upon replacing Italians on that most important sector of the entire Italian Front. On the main part of the Western Front, between Switzerland and the North Sea, French and British forces aggressively continued to try to achieve something, really anything, in the face of German resistance that continues to wear thinner yet never grows any weaker. Along the Netherlands border, British forces wistfully considered how much more powerful their attack could be had the Germans taken Oostende and been accessible to the Grand Fleet. Absent so many heavy guns to bombard the defense, the Army having only six regiments of heavy guns at the front and their use being effectively impossible of achieving notable effect (and the British siege and combat engineer arms being gutted), the usual straight-up charge into the machineguns inevitably followed. A German interception mission failed to drive away British reconnaissance aircraft, one of two groups of which achieved their mission, so that after national will and entrenchments the attack went forward with a +1 bonus. A risky 2.4:1 attack rolled downward but decent leadership at the battalion level (roll 5) kept the result a sadly welcome Both Exchange. French forces, in the midst of redeploying their best forces from the sector east of Maubeuge to the sector west of Metz, cast about for any target they could plausibly hit and rested their gaze upon one of their usual fields: grid 1120. The defenders enjoyed the usual woodlands, entrenchments, and the protection of a river on one of their two hex sides. French forces brought successful aerial reconnaissance, two successful attempts of two brigades of engineers each, and national will to bring the balance to a net +2 modifier. French gas engineers failed their sixteen percent possibility to be a positive influence. Odds of 2.6:1 rolled upward but bad tactics at all levels (roll 2) yielded another sadly welcome BX result. In reaction, the Central Powers actually moved to attack despite missing, as usual, the vast bulk of their army activation rolls. German forces massed against the stout Belgian force defending the tip of the Entente salient east of Maubeuge but decided not to actually pull the trigger in view of limited stockpiles of ammunition (the Germans are nearly out of resource points after a long summer of heavy combat) and the failure of their one aerial reconnaissance mission. Elsewhere in the air, three zeppelin groups missed Milan and one missed London, after a British fighter conducted the first patrol attack of the war, but another Zeppelin group successfully bombed the headquarters of The Times, causing a noticeable drop in British morale. In the south, one of two Germanic bombing missions against Italian ammunition stockpiles torched a resource point. The only interesting aspect of Entente exploitation was a visit by three reconnaissance groups of the French air forces to the zeppelin base at Koln. Flak sent one group scurrying and the other two missed their chances, but it is noteworthy that the French now have enough air units to both support a ground attack and try bombing something significant on the ground. As if to point that out further, a couple of groups of French bombers missed German ammunition dumps in Belgium. The Central Powers turn of the first half of October 1915 passed with a bang and an attempted bang, both in reaction. First, however, replacements flowed in relative rivers for several countries. On the main front, German forces adjusted to their continuing losses and tried to keep up with their endless conversions, but found time and assets to render the bulk of the Ardennes Forest almost unassailable, bumping defense values by something like 25-percent thanks to an array of reinforcements from elsewhere. Austria-Hungary likewise strengthened its own position, moving units to protect the coast, but especially the seaward flank of the main line on the Isonzo River. Austrian units also began to move to threaten the inland flank of the Italian line extending from the Isonzo into the previously impassable Alps that Germanic high mountain units are suddenly rendering less protective. In the air, the Central Powers did not enjoy early October. Three groups of zeppelins missed Milan and two missed London. Two reconnaissance groups attempting a counter-air mission against the French suffered 25-percent losses to flak while a French counter-air mission in reaction destroyed half a group of Alb C1’s on the ground (the Germans will enter the next air cycle without a maximum savings in ARPs, another first for this game). Various Italian, Austro-Hungarian, and German aircraft missed targets or were rendered harmless by flak. On the ground, in reaction, three notable things happened. Italian forces shifted considerable force away from the Lake Garda sector, though still leaving what they expect to be enough to hold the ground briefly until the French come up or the Italians come rushing back. The French headquarters in Belfort activated and tried to put together an attack across the Rhine River near the Swiss border. The attack would have gone forward had both air groups not failed their spotting missions. In a bloodier event, the British again assailed the German front on the Dutch border. National will and air reconnaissance more than countered entrenchments and 2.3:1 odds rolled upward so that a competent combat roll resulted in the usual BX result. Before the advent of the Web, the name of George F. Nafziger was already a staple in wargaming circles. His work on the wars of the French Revolution and his collection of well-researched Orders so Battle, especially for the Napoleonic area, made him the first adress for anyone wargaming that time. Nafziger started to make singe OOBs available via the Internet in the Mid-Nineties, and his now rather weird looking website enabled visitors to order print-outs of selected battles and campaigns. In 2010 Nafziger retired from publishing those OOBs and donated his whole collection to the public domain. It is currently hosted at the US Army’s CARL website. Additionally Alternatewars.com culled the complete archive and made it available as a collection of zipped archives for quicker access. The Nafziger Collection itself contains orders of battle from 1600 to 1945 with over 7000 individual pdf files. What makes those files special is that the majority of them is based on archival sources, which are not easily accessible for mortal souls like us. Its depth and scope are unparalleled anywhere, and I can only highly reccomend taking a look, even if the access is a bit cumbersome. The new navigation is up and running in English, too, though it does look less than optimal in Internet Explorer, and the language picker seems to be a little flawed – again. I need to work on that. In other news, we’ve started a collection of interesting Links, and the armory is now exclusively dedicated to the Europa games (including, soon, TEM and various play aid kits). And yes, much remins to be done there, as a lot of games lack a proper descriptino and/or further ressources. As usual my ressources are not mathcing my ambitions. 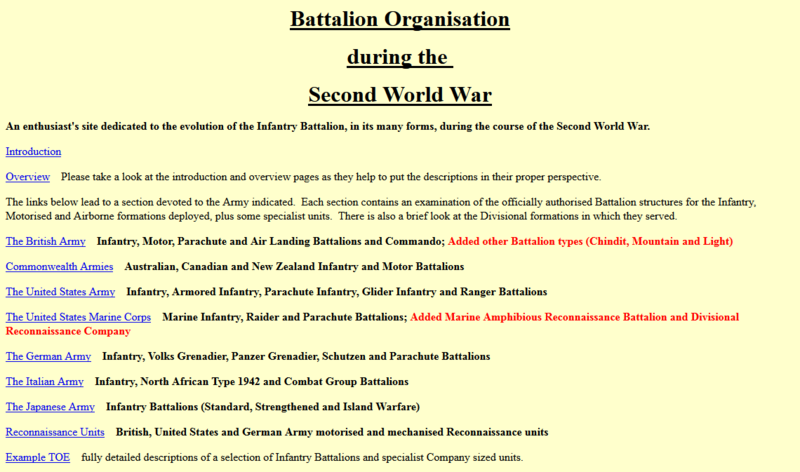 “Bayonetstrength 150” is the most knowledgeable website on bataillon sized units in second world war that we know of. Its name aptly describes focus and content: its all about organisation, training, equipment, and action of bataillion-sized units on the various battlefields of World War II. Its author, Gary Kennedy, not only manages to describe the theoretical structures of these fundamental buidling blocks of armies, but also captures the reality of their emplyoment and the subsequent changes that attrition and battle wear forced on them. Based on a prolific bibliography on the subject Kennedy manages to describe the close interaction between organisation, equipment, and training in a way that makes it accessible even for laymen. The page is spartan and in simple HTML, the only compromise to usability is the color coding of various sections. A host of index-pages and introductions lead to some redundancy, but ensure the reader never feels lost. A must-read for anyone interested in the topic of tactical combat in World War II. or you can contact me, since I do have an offline copy. I am rapidly improving the site right now, at least it looks like that to me. From the outside, it probably gives the impression that I’m making a mess of things. I managed to plug the great navigation presented by Guillaume Marty on NetTut+ into the german version of the site, and will work on the english part today. A lot still remains to be done, but slowly am inclined to call what I have assembled here of bits and pieces a flatfile CMS. In any case I think the site will improve visibly in the next days. I started working on the website again some days ago. The most noticable change will be font sizes – I found it uncomfortable to read longer articles with the standard font size. Now I am expanding the german glossary and have also started assembling an english glossary, which has since grown to potentially take over the whole “arsenal” section, depending on how much time I find in the future.